One the more enjoyable things about reading Macro Man recently is that the author's mood, as well as the spirit of the more battle hardened of his commenters, have been lifted significantly. This is not because they necessarily wanted Mr. Trump to move into the White House, but rather because the political shock in the U.S. appears to have brought back good old fashioned, active, macro trading. I am not sure it ever left, but I sympathise with the idea that the change in political winds in the U.S., and Europe, will unlock hitherto barren markets for swashbuckling macro investors. The added joy of such a story would be that the index huggers and risk-parity brigade would see their clout diminished somewhat . After all, bond yields are now rising again, and next year's political constellation in Europe could well create a number of new currencies to dabble in. I doubt Macro Man will be that lucky, though, but one can always dream I suppose. In my last post I donned the violin and gave a personal dissection of current affairs. In what follows I heed my own advice and take an ultra-cynical view of a number of investment themes that are, or could be, emerging. The devastation of U.S. bonds since the election probably has been the most startling price action. Bond investors have vanquished many enemies in this business cycle, but it seems that Mr. Trump's promise of significant fiscal easing, via substantial tax cuts and spending on infrastructure, is their gravest threat to date. Some investors already have used the rout to proclaim the end of the multi-decade bull market in bonds since 1980s. I won't hazard a guess that bold, and I think it is fair to say that the market has run away with the Trumponomics narrative, in the short run at least. But that does not mean that the story isn't sustainable in a cyclical sense. The knee-jerk narrative appears slightly asymmetric to me though. It is very easy, at least in equities, to discount the Trump story via lower taxes and stronger growth, which has resulted in a substantial rotation out of bonds into stocks, and sector allocation in favour of financials and cyclicals. It is slightly more difficult to discount the bad stuff such as free trade barriers, high inflation, the Fed scrambling to get on side, and a strong USD. I am inferring here that the reaction to these effects probably comes later. First, the curve steepens but the flip to a flattener could be abrupt if the Fed has to move quickly. The key story is that the doomsday loop of stocks and bonds rising and falling together appears to have been broken, if only temporarily. This matters because it gives (active) investors more strings to play on, which provides a more balanced market. This at least is the theory. It also restores the credibility of the stock-to-bond ratio as an asset allocation signal. It is not that this ratio has not been working, but rather that it has been difficult to interpret because it has not reflected inverse performance of stocks and bonds, but rather over- and underperformance. So what signal is it sending at the moment? Time frame matters for the conclusions you can draw here, but on a six-month basis, stock-to-bond returns—S&P 500 returns excluding dividends—are not extreme. The chart below shows that the spread is currently about 10%, which is decent but not extraordinary. In the past, 20%-to-25% excess returns of stocks over bonds has been a decent signal to rebalance in favour of bonds. In other words, based on this indicator, the Trump trade still has legs. My view on equities since the end of the summer has been that it was probably best to steer clear from aggressive exposure after the strong jump from the Q1 crash. That call appeared to have been maturing nicely, but then Mr. Trump arrived on the scene. Initially, futures were limit down, but soon the headline equity index in the U.S. roared to new highs. Fading the initial knee-jerk reaction has been a good strategy so far this year. In this context, breadth on the S&P 500 has made a spectacular reversal, and the net new 52w highs now suddenly signal that market health has returned to normal. This indicator gives no guarantees, but based on its most recent history U.S. equities have been a difficult short on anything but very short frames as long as this index has been above zero. My trusted valuation score, however, continues to suggest that a tradable bottom in the first quarter is the best bet, which is what I am sticking with for now. …or will valuations regain importance? The U.S. dollar and C/A deficit, Quo Vadis? Where the U.S dollar and the U.S. C/A deficit go in the next 12-to-18 months will say a lot about how Mr. Trump's economic strategy will work, and how it will feed into the global economy. I have been discussing this with other economists on Twitter, and what better occasion to announce that Brad Setser is back in the blogging saddle. His latest missive takes a look at the potential trajectory of the U.S. C/A balance based on what exactly the new U.S. administration intends to implement. Basically, his argument, and this has been mine too, is that if Trump wants to rev up the fiscal motor, the CA deficit will widen and dollar increase. This is to say that the rest of the world will get a ride on higher U.S. growth. Here is Brad explaining the mechanics. (...) just as fiscal expansion should reduce the external surpluses of those countries that now run sizable balance of payments surpluses, fiscal expansion in a country with a sizeable balance of payments deficit, in any conventional macroeconomic model, implies a bigger balance of payments deficit. And how much could the C/A deficit widen then? Well, a significant amount of guess work is needed here, but Brad gives us a reasonable range. Add these factors up, and it seems reasonably likely the U.S. current account deficit will be back above four percent of U.S. GDP within the next couple of years if there is a significant fiscal loosening. And the U.S. (goods) trade deficit could easily approach six percent of U.S. GDP. It is fair to say that this is not what the current U.S. administration wants, but it is difficult avoid it if they really go for it. Incidentally, I think there is an upside story for EMs too because they are well positioned, given weak FX, for a Bretton Woods II redux in which they orient their exports to the U.S and the financing of a wider U.S. deficit. Of course, if Trump wants to let fly on fiscal stimulus without letting foreign money in—or limiting it at least—the cost will be much higher inflation in the domestic economy. After all, labour intensive construction work does not increase productivity in the short run, so the cyclical result would be inflation, and I think this is partly why the U.S. bond yields have responded as strongly as they have. As for the dollar, I can't see past the political haze in the EZ now given the gravitas of the coming political events. The fact is that if you read the programs of Marine Le Pen, the Five Star etc—which I have belatedly started to do—it's very unclear exactly what they want to do with the euro if they are elected. We have soft-exit, hard exit, bilateral devaluation against Germany and so on. It is also difficult to gauge exactly what they can do in terms of extracting their economies completely from the Eurozone if that is indeed what they want. But they want to do something, which probably involves holding a gun to Germany's head. In short, the unpredictability of these guys is huge. I don't think anyone would want to leave with Draghi in Frankfurt ; I think they want to use the euro as a fiscal and monetary WMD. But the road from here to there is paved with lots of head banging for investors. If the Fed goes, rate differentials could plausibly widen further setting up a move to parity and below for EURUSD. What if the good guys lose? "So Brexit was not a historical accident after all. The Trump victory seals it. A complacent, mainly urban liberal class, has been undone by a revolt. Nationalists are in charge of Washington and London now. These “strongmen” and “strongwomen” will control borders, restrict the movement of labour and subject cross-border M&A to ever tighter public scrutiny tests. Security will come first. The twin freedoms of capital and labour movement are fading, secular relics from a passing liberal age." We can't say for sure whether such a gloomy forecast will be proven correct, but we have enough evidence to suggest that we're plausibly moving towards a version of the world Mr. Rossi presents above. So what happens next? One country that immediately comes to mind as a big loser of this is Germany. Merkel already is being hailed as the leader of the free world, but do we really want to bet on Germany pulling the world out of the swap? I certainly don't. In many ways, the highly competitive, prudent, and proper German manufacturing sector is the antithesis of the world described by Rossi. It could well be crushed under weight of Mr. Trump, Brexit and the rise of anti-Germany C/A surplus  populists in Europe. Indeed, "unfairness" could play a big role here. Consider the scenario where Mr. Trump decides to give "ambassador" Farage and the U.K. a free-trade agreement, but Germany just gets the middle finger. Because you know, they're my mates, you aren't. U.K. manufacturing would sail into the sunshine on tariff free access to a rapidly growing U.S. economy with the "leader of the free world" left outside in the cold. Long U.K. industrials/short German industrials would be the way to go, at least in spirit. Can you imagine how smug the opeds by Farage, Ambrose-Evans and the rest would be? It would be unbearable and supremely annoying but objectively speaking, it could well happen. The last bastion of an old world order? The chart above shows that industrials in Germany are poorly priced for a change in rules of global economic governance with respect to free trade. Adding insult to injury, in the event of one or more countries sliding out of the Eurozone the revaluation would be particularly hard on German export-oriented businesses, at least initially. In short, the upside for valuations here appear limited while an abyss has opened to the downside. The portfolio has hit the skids in Q4. The October decline was in line with a poorly MSCI World, but what looks like a flat November is well behind the 1.3% month-to-month jump in global equities as markets have rallied on the back of a strong rebound in financials. 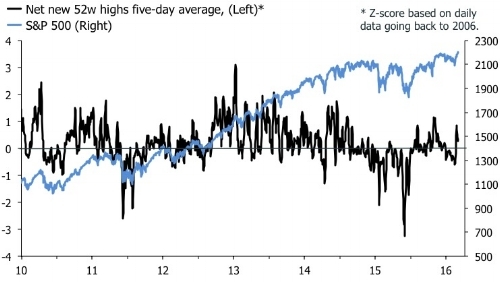 That's not earth shattering of course, but it marks a change compared with the healthy outperformance earlier in the year. The position in Wells Fargo has enjoyed the "Trump trade" but the Home Depot short has been a big drag this month. Elsewhere, it's mainly the big exposure to commodities and gold, which has hurt relative to the global market. I have made a couple of adjustments since I last updated on the portfolio. The position in Restaurant Group has been sold with a small profit. Valuations are, in principle, favourable but momentum is turning and I am not sure that this is the right time in the cycle to be holding this one. I have taken advantage of the setback in gold miners, and added to that position. Finally, I have opened a trade in Banco Sabadell. My friends will kill me for this, but it's at the bottom of the range, and if the Eurozone does not disintegrate I still believe in steeper curves to help financials. Finally, Sabadell recently bought TSB in the U.K. which gives the trade some "Brexit diversification". Overall, the portfolio is way too defensive if the recent breakout in global equities is sustained, but it should not be left completely in the dirt if that happens. After all, if the opportunity set is indeed widening, investment options should increase. - I am talking my book. As an independent researcher, it is great to have the big ETF and fund providers as clients, but too much concentration isn't necessarily a good thing. So if macro trading hedge funds/trading are about to have a renaissance, I am all for it. - Only a summary I am afraid. - I will have more to say about the German surplus at another point.